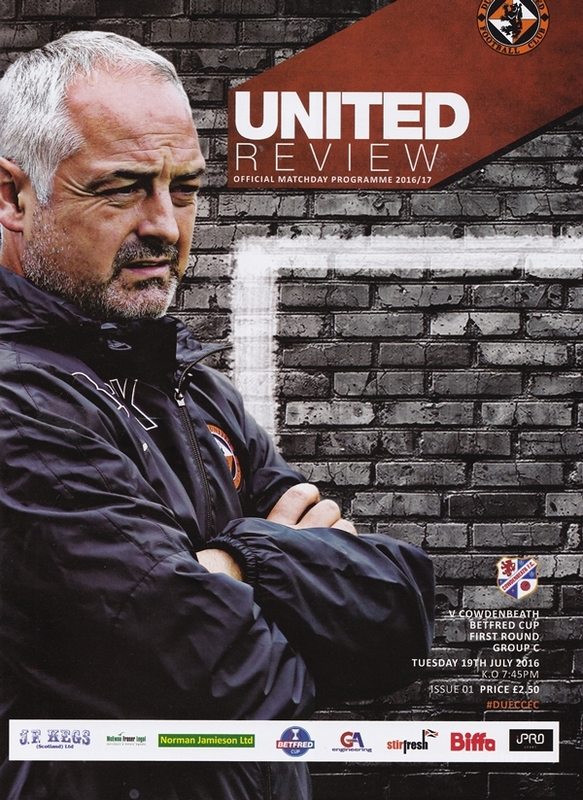 It would take four minutes for United to take the lead in front of a sun-soaked crowd at Tannadice. The ball was worked forward down the left side by Sean Dillon and Paul Dixon. The left back played a weighted through ball ahead of Tope Obadeyi who was starting out on the left. The English winger used his pace to surge past Cowdenbeath's right back and dispatched an early cross low across the face of goal. The cross was met by the onrushing Simon Murray who bundled the ball across the line from close range for his first of the season. A series of free kicks for the Tangerines in attacking areas lead quickly to a second goal. Cammy Smith was held by Chris Turner on the right and the referee duly awarded United a free kick in a promising area. Scott Fraser attempted to play it quick but referee, Crawford Allan pulled it back. The second attempt was whipped into the six yard box. Fraser's in swinging cross out foxed the Cowdenbeath back line and was met on the half volley by Lewis Toshney who turned the ball in with his right foot for his first goal in Tangerine. Attempts by Fraser and Smith were saved before Willo Flood hit a right foot shot from outside the area which went high and wide as the home side kept up the pressure on their League Two opponents. The pressure would pay for the hosts with 21 minutes played. Patient build up from the back allowed Fraser to take possession in the midlle of the park. He turned well and surged forward. The Cowdenbeath back line failed to maintain its shape allowing Fraser a path to play in Smith and play him in he did. 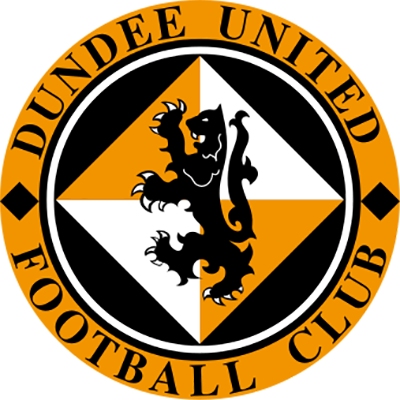 A beautifully weighted through ball found Smith inside the box with acres of space and he played the ball low past Grant Adam in the goal for Cammy Smith's first Dundee United goal and the third of the match. Five minutes later Cowdenbeath fans were given reason to cheer as their side pulled one back thanks to a superb strike by Chris Turner. 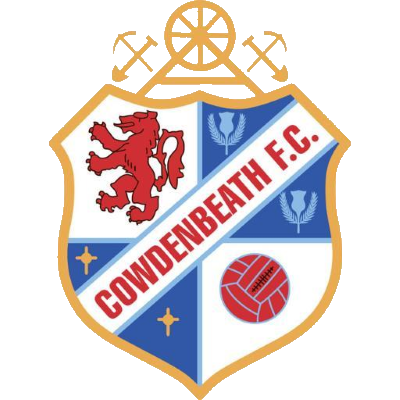 Cowdenbeath did well to move the ball around in their first real spell of meaningful possession. With the ball out wide on the left in space within the United half, Lewis Moore took on Toshney. Moore laid the ball back to Chris Turner who had space. He turned the ball onto his left foot and hit a wonderful effort from within 25 yards that gave Cammy Bell no chance. A fine strike that even earned the applause of United supporters as it smashed into the back of the net. United's fourth arrived after 32 minutes through Simon Murray. United built from the back allowing Obadeyi to cross the ball from the left. His cross was just cleared and the visitors tried to move the ball forward. Good pressure from Flood regained possession on the right and United tried to make in roads on the Cowdenbeath area. The Blue Brazil's defence failed to deal with the attack convincingly which allowed the hard-working Cammy Smith to drive to the byline. Smith cut the ball back excellently from the right byline to Murray at the penalty spot. The pass arrived with such precision that Murray was able to turn the ball into the net with one touch to reinstate United's three goal advantage going into half time. The second half progressed with both teams creating chances but nothing on target. 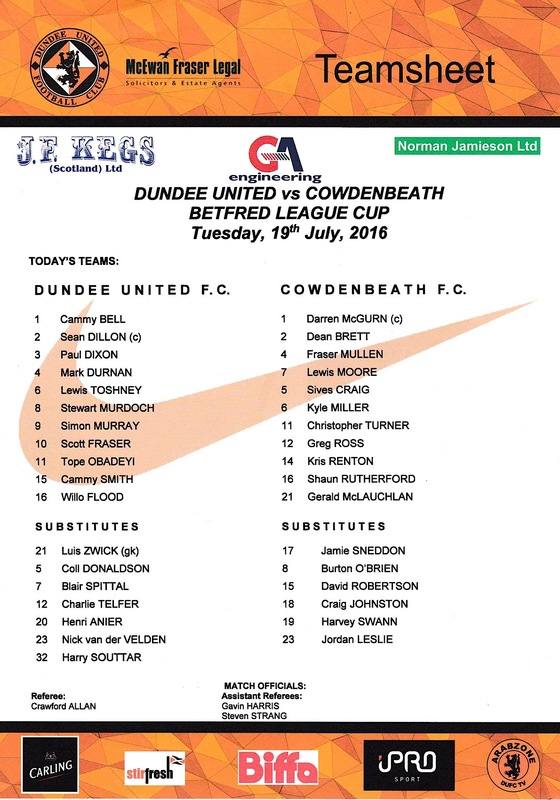 Fraser Mullen went close for Cowdenbeath before Scott Fraser hit a shot too high to trouble Adam in goal. United made two substitutions with just over an hour gone - Blair Spittal for Obadeyi and the debuting Nick van der Velden for Fraser. As the sun began to die down, Simon Murray wrapped up his hat-trick with 71 minutes played and with another right footed finish. United controlled possession in midfield and van der Velden slipped a good ball just inside the right hand area of the box for Toshney. His sliding cross was blocked at the near post but it broke to Murray who swiveled and finished neatly at the near post. A hat-trick for the striker to cap a fine performance. The hat-trick hero received a standing ovation as he made way for Henri Anier with 15 minutes remaining. The game settled down with hardly any chances of not until Anier and Smith had attempts in the latter stages. However, Anier did add his name to the score sheet with 88 minutes played. United built out through Flood before some neat one touch football involving van der Velden and Murdoch released Henri Anier in behind the Cowdenbeath defence. He advanced into the area and hit a nice left footed strike beyond the hapless Adams to wrap up a fine evening for United against a very poor Cowdenbeath.